FAO’s latest forecast for world cereal production in 2014 stands at a new record of nearly 2 534 million tonnes, marginally higher than estimated in December and 13.5 million tonnes (0.5 percent) above the 2013 output. The small (1.5 million tonnes) production upgrade since December reflects a positive revision for coarse grains that more than offsets a reduction for wheat and for rice. Early indications for 2015 crops are favourable. In the northern hemisphere, plantings of the 2015 winter wheat crops were generally completed under propitious weather conditions with larger plantings in North America and the Near East outweighing decreases in the Russian Federation and parts of Far East Asia. The 2015 maize crop conditions in the southern hemisphere are also satisfactory although lower prices resulted in some reductions in plantings in South America. As for rice, plantings of the 2015 crops have been hindered by excessive rains in South America and in Sri Lanka, while drought curbed the area under rice in Australia. In Madagascar, the recent passage of a tropical storm is reported to have caused major damage to crops. On the other hand, Indonesia has announced a 2015 rice production target that would imply a 4 percent recovery from last year. 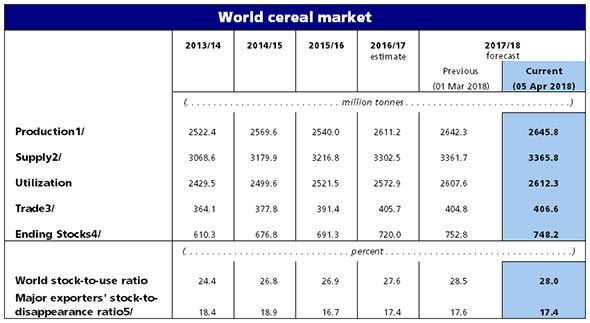 World cereal total utilization in 2014/15 is estimated at 2 467 million tonnes, up slightly from the December forecast and 2.2 percent (53 million tonnes) higher than in 2013/14. The upward adjustment since December mostly reflects higher feed use of sorghum in China than previously anticipated. In 2014/15, globally 1 104 million tonnes of cereals are forecast to be used for food consumption, unchanged from the previous forecast and 1.1 percent higher than in 2013/14, keeping the world per capita consumption annual average stable at around 152.8 kg, with wheat at 67.4 kg and rice at 57.5 kg. Total feed use of cereals is seen expanding by 3 percent from last year, to 876 million tonnes, with most of the year-on-year growth driven by maize, supported by this season’s more abundant supplies and lower prices. Global cereal stocks by the close of seasons in 2015 are forecast at around 623 million tonnes, almost 6 million tonnes less than anticipated in December, but still 46 million tonnes (8 percent) above the volume carried over from 2014. As a result, the global cereal stock-to-use ratio in 2014/15 is likely to reach 25.0 percent, its highest level since 2002/03 and well above the 2007/08 historical low of 18.4 percent. Notwithstanding a 5.6 million tonnes cut in the forecast since December, world closing inventories of coarse grains are anticipated to approach 253 million tonnes, as much as 32 million tonnes higher than their opening level. This month’s downward adjustment largely reflects lower maize carryovers in the United States as well as smaller inventories of barley in China, the Russian Federation and Ukraine. The forecast for wheat ending stocks remains at around 192 million tonnes, 17.4 million tonnes more than in 2014, with most of the increase concentrated in China, the EU, India and the Russian Federation. By contrast, rice world inventories are foreseen to drop by about 4 million tonnes in 2015, with particularly strong reductions expected in India, Indonesia and Thailand. The FAO forecast for world cereal trade in 2014/15 has been raised by 3 million tonnes since December to 341.5 million tonnes, still 15 million tonnes below the 2013/14 record. The forecast for world trade in coarse grains in 2014/15 (July/June) has been raised by 1.5 million tonnes to 149.5 million tonnes, some 9 million tonnes below last season’s level. The revision stems from expectations of larger trade in sorghum, sustained by strong import demand from China. Global wheat trade in 2014/15 (July/June) is forecast at 151 million tonnes, 1 million tonnes higher than foreseen in December, but almost 6 million tonnes lower than in 2013/14. The revision for 2014/15 takes into account expectations for increased wheat exports from the EU, India and Kazakhstan more than offsetting expected lower shipments from the Russian Federation following the approval by the Government of new export taxes to be introduced from the beginning of February. The forecast for rice trade in calendar year 2015 has also been raised, by about 500 000 tonnes, to a level close to the 2014 record, as large supplies in exporting countries are anticipated to keep world prices attractive to importers.